Bitcoin overwhelmed the world in 2017, rumbling into the popular consciousness like an out-of-control freight train. 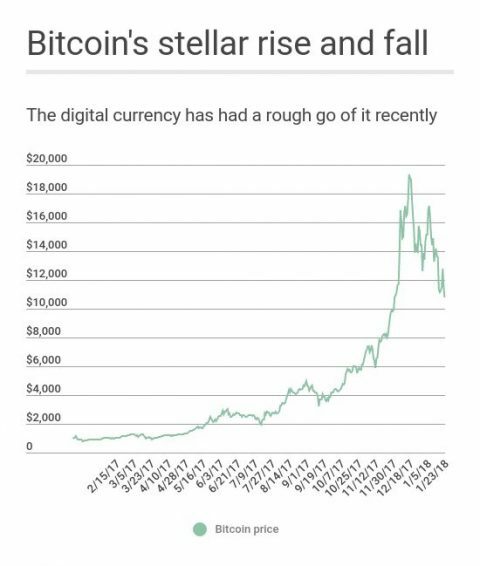 The price of the cryptocurrency soared more than 1,300% last year, and while 2018 hasn’t been so hot so far — the price has risen then plummeted sharply — many speculators are still hot for bitcoin. The stories of what people have done to buy bitcoin are just outrageous. Some have mortgaged their houses, while others are using credit cards to buy the currency. It’s now a punchline that buyers know little about bitcoin other than its price has shot up quickly. It’s the kind of behavior that is typically seen in a financial mania, or bubble. So it’s worth asking: Is bitcoin a bubble? Let’s take a quick look at a few of the more amazing bubbles in history to see what they might tell us about bitcoin today. First, what is a bubble? A bubble occurs when the price of an asset goes up and beyond any rational explanation. Speculators swoop in to buy and drive the price up in the hopes of selling to someone else later and taking a profit. It’s called the “greater fool” approach to investing. Bitcoin exactly fits the theme of the bubbles discussed below. In each case, speculators bought assets that didn’t produce cash flow over time and hoped to sell them later to someone who was even more optimistic — the greater fool. It’s why bitcoin bulls should tread very carefully, and why one of the world’s greatest investors says to beware of bitcoin. Dutch tulip mania. It doesn’t get much wackier than Holland’s intense and very explosive love for tulip bulbs in the 17th century. It’s hard to oversell just how strange it all became. Tulip-bulb mania took a few years to grow, but once fully bloomed it turned into a riot. In the 1620s, tulips were already popular but were being used in trade, and early signs of mania were apparent. One would-be buyer offered a townhouse in exchange for 10 tulip bulbs — and was rejected. When tulip mania peaked in 1637, prices increased 1,100% in a month, and bulbs might be changing hands up to 10 times per day. Finally, the Dutch decided that prices were too high and plunged out of tulips, sending the price plummeting. As in virtually every bubble, some heedless speculators had wagered everything they owned. The blowups were high-profile, at least for the time: Kosmo.com, eToys and pets.com. Once heralded as the future, they’re now laughable memories, like the Pet Rock or Beanie Babies. Even with few prospects for making money, many dot-coms traded at lofty valuations, and then the year 2000 saw the bursting of that bubble. Still, some high performers did come from that era — big names such as Amazon, Priceline and Google. But the overwhelming aftertaste is bitter. The housing bubble. The U.S. housing bubble in the 2000s is still too raw for many people, and though the economy is finally back to normal (more or less), lessons from the crisis remain illustrative. The stories of excess were rampant. Borrowers taking out multiple loans, or taking out loans that they had no ability to repay, so-called liar’s loans, and the banks turning a blind eye. Plus, as prices rose, homeowners could borrow against their houses and then spend that cash. But when housing prices plunged, these homeowners were underwater on their houses and still on the hook for that debt. As with prior bubbles, housing speculators often gambled way more than they could sustain and counted on selling to the greater fool to make a profit, rather than relying on the investment’s cash flow. The storyline around bitcoin is how it will change everything, how skeptics just don’t “get it” and how wise old investors are hopelessly old-fashioned. With all these promises, the currency ran up strongly in the last few years. Yet despite a strong run at the end of 2017, the price of bitcoin was hammered in January 2018. Here’s how the cryptocurrency has performed since the start of 2017. Of course, it’s not just bitcoin. Virtually every major cryptocurrency has been punished. But that’s exactly what happens with an asset, like a currency, that doesn’t produce cash, in contrast to a well-managed and cash-flowing business. Bitcoin and other cryptocurrencies may someday have a practical use, but they will never become value-producing assets — like every other commodity (orange juice, oil, pork bellies, etc.). And this is why arguably the world’s greatest investor, Warren Buffett, wouldn’t even buy them with your money, let alone his. If it doesn’t produce cash flow, Buffett doesn’t want it. So what’s the alternative for investors? Buffett has long espoused the idea that individual investors should buy a fund based on the Standard & Poor’s 500 index of America’s largest companies. It’s composed of cash-flowing, value-producing assets, and has a solid track record of 10% long-term annual returns. He’s advised investors — especially those who know little about investing — to buy the index regularly, particularly during times of panic. It’s great advice — plus, it’s easy to get started buying a fund . The article Is Bitcoin the Next Legendary Investment Bubble? originally appeared on NerdWallet.